Victor Brandt - Entombed A.D.
LG Petrov - Entombed A.D. 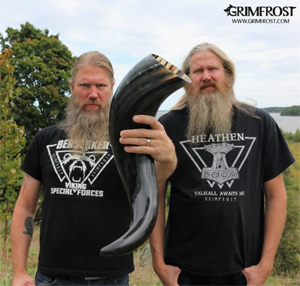 Starting today, fans also have the chance to win a Grimfrost prize pack, including their own carefully polished and cleaned top quality Viking drinking horn (which holds 4 liters, 8 pints or 128 oz)! The grand prize winner will also receive a Berserker t-shirt, Heathen t-shirt and a stainless steel Wolf King Chain with Grimfrost's Thor's Hammer necklace, all featured in the photo above. Presented by AMON AMARTH in partnership with Grimfrost, the contest is open to the global public, and ends on October 10th @ 9AM PST//12PM EST//6PM CET. To enter, please visit: http://www.amonamarth.com/raise-your-horns and merely submit your email address!